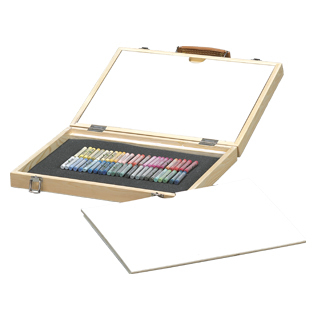 * Foam inset to protect your precious pastels Divider section too. * Wooden with clasps and handle. 17" x 15" x 3"
This product is shipped from our warehouse in Detroit, MI, USA. A 20% handling charge is levied against all authorized returns except those due to our error. Unauthorized returns are subject to a 35% handling charge.